“Intelligence, academic performance, and prestigious schools don’t correlate well with fulfillment, or even with outstanding accomplishment. The traits that do make a difference are poorly understood, and can’t be taught in a classroom, no matter what the tuition: the ability to understand and inspire people; to read situations and discern the underlying patterns; to build trusting relationships; to recognize and correct one’s shortcomings; to imagine alternate futures. ” David Brooks, Social Animal, The New Yorker, January 17, 2011. In the language of my current company, this balance between what people want from their participation, and the actions that will produce the desired results, is called “shared vision”. It has become part of the fabric of our corporate culture – and perhaps the most challenging concept to internalize for anyone new to the organization, whether it is a single employee, or the whole team coming onboard after an acquisition. Christensen also applies this concept to the family life, and this is where it gets even more interesting, as you get to the point where command and control stops working, and “because I said so” is no longer an valid argument (nor that it ever really was) – and by then you better have developed the shared vision with your child, this common understanding of what is right and what is wrong, and how to make good choices and avoid bad ones. After a longer than acceptable hiatus, I am restarting my academic work. My immediate focus is on developing an understanding of the academic landscape in the areas of small group collaboration. I am particularly interested in looking at problem-solving groups as self-organizing systems. Each member of the problem-solving group brings their own unique combination of skills, knowledge, and prior experience, and the success of the group problem-solving depends on diversity of experiences of group participants. The group is self-regulated and only exists with the particular membership for the instance of a particular problem-solving event. After the problem is solved, the group dissolves and may be reassembled with the same or different membership during the next situation when this type of participation is needed. In the next few months, I am working on building a theoretical foundation for my dissertation work on knowledge co-creation in small problem-solving groups. I was on yesterday was and schedule before the use of the estimate based on the body of it because the designation weather or what the yeah she doesn’t look good. Lunch Program. Well I’m Linda all my money right now. I’ve been watching for you on your. Well, I’ll talk with each other. I just want to discuss poorest via Samos messages and Campbell. Bittel horrible. And don’t worry I’m not. Hey I’m on my telephone so is the voice him that he said he said lucky session resources. David’s you really my cellphone, Hi, this is the voice in just left, so if you have a Steven off of the Lebanese if you bye. Or you read this all otherwise have several show. Yes, you assume you’re at it. I know that quit their intention is going great. I would really love her so go ahead. Sorry you and we are a model you know that they’re celebrating again. You know we’ll see if she was because yo dude, I was hoping for a couple of Appointment door sweating new address. Andrew, which is restrictions. How are you. I’m gonna send it, couple of minutes. Okay. Well I’m calling in life. Lala, I was on yesterday was and schedule before the use of the estimate based on the body of it because the designation weather or what the yeah she doesn’t look good. Lunch Program. David Kay and I presented at Technology Services World conference last week. The topic of our presentation was “Creating Strategic Alignment Across a Large, Complex Organization” – covering the process we went through to bring multiple business areas at Intuit together to create a comprehensive Knowledge Management Framework. This was a very interesting journey, and the lessons learned were not just about Knowledge Management processes, but also about change management. Below is the session description, and the text of the presentation is available here. Intuit’s business units pride themselves on their customer focus and on delivering ease of use. Each organization optimized its service and support offerings for its very specific customer segment—from consumers using Quicken® and TurboTax®, to small businesses using QuickBooks, to large enterprises managing their real estate. Not surprisingly, service and support strategies for such diverse customer sets seemed to demand equally diverse sets of business processes. 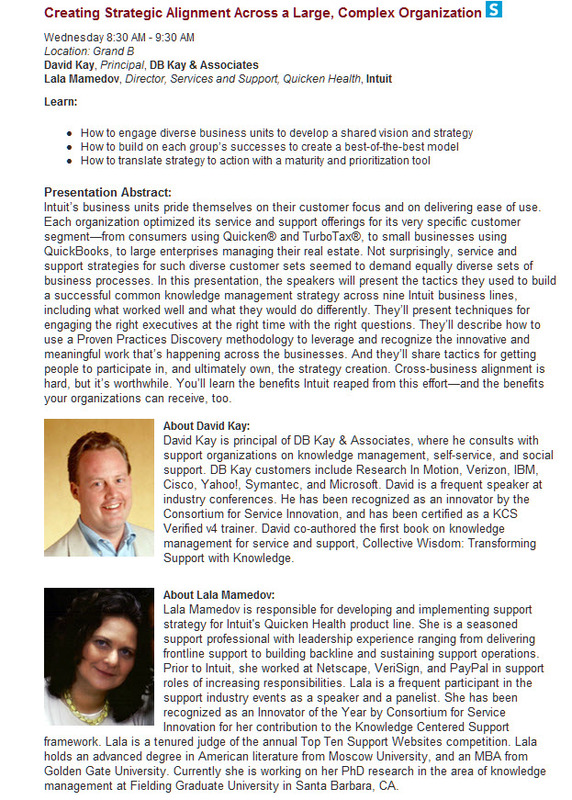 In this presentation, the speakers will present the tactics they used to build a successful common knowledge management strategy across nine Intuit business lines, including what worked well and what they would do differently. They’ll present techniques for engaging the right executives at the right time with the right questions. They’ll describe how to use a Proven Practices Discovery methodology to leverage and recognize the innovative and meaningful work that’s happening across the businesses. And they’ll share tactics for getting people to participate in, and ultimately own, the strategy creation. Cross-business alignment is hard, but it’s worthwhile. You’ll learn the benefits Intuit reaped from this effort—and the benefits your organizations can receive, too. Some time last month, my site was hacked by some imbecils for some nefarious botnet malfesance. To add insult to injury, the attack was apparently coming from Russia. Probably some dropout from my old high school in Moscow, with IQ too low to become an oligarch and too high to get accepted into KGB (or whatever they call themselves these days). Google Webmaster Central helpfully flagged the site as malware, but neglected to notify me that it did. I could not even access the site admin panel from FireFox, had to go use a computer with IE which was very nonchalant about allowing me access to malware-infested site. Ughh. I had to rebuild the entire site (and put it on automatic backup). Unlike the well-structured traditional problem resolution process, the collaborative problem resolution that I am interested in is frequently ad-hoc. Groups self-organize around a problem, and dissolve after the solution has been identified (hence the “swarm”). In fact, the most successful problem-solving results are produced by highly diverse groups from different functional areas. The activity of joining such group could be considered a social ritual. This unarticulated ritual includes the trigger for group’s creation, the explicit or implicit permission for joining the group, the level of information-sharing in the group, the norms for using the knowledge generated in the problem-solving process, and, finally, the protocol for exiting and dissolving the group. Traditionally, these ad-hoc groups are observed in an open face-to-face environment, where people can easily join a conversation that they happen to overhear. Collaboration becomes more challenging in the digital environment, where participants are not interacting face-to-face. What are the new social rituals for collaborative problem-solving in the digital domain? Is it acceptable to forward and email with the question to another person who many have insights? Is it OK to quote any of the participants and what level of attribution is expected? And so on. The type of collaboration I have been talking about so far is the collaboration between members of the same organization. In the last decade, a new type of collaboration has emerged – Internet-facilitated collaboration between complete strangers providing value to an organization they are unaffiliated with. This type of collaboration is frequently referred to as “crowdsourcing”. In this type of collaboration, large groups of people may solve problems through interaction in online forums (Microsoft Usenet forums or Novell Sysops forums) , generate encyclopedia content (Wikipedia.com, Mahalo.com) , offer tax and accounting advice to each other (Intuit Live Community), write literary reviews (Amazon.com, LinraryThing.com), generate entertainment (or what goes for entertainment these days – YouTube.com) and so on. Collaboration of this type is purely digital and has different social rituals around it.